I had never tried Lush products at all until this year. In all honesty, I wasn’t sure how I felt about the very strong perfumed products as I walked passed the store so I had convinced myself there was nothing in there for me. This year, as part of my birthday present, my best friend bought me a lush gift box full of bath bombs. I absolutely loved it! As soon as I tried my very first bath bomb out (granny takes a dip if you’re intrigued) I knew I had to find out a little bit more about the brand that creates these magical concoctions. After doing some blog reading online, I found out that they did some great skincare products so jealous decided to go and have a peruse. Pretty much as soon as I walked into the store I was greeted by a lovely staff member who I decided to open up to about my skin concerns. She was extremely helpful and recommended I try one of their cleansers – Angels on Bare Skin. The sales assistant had flawless skin, you know, the type that you can’t get with makeup so I was really pleased to hear that it was the cleanser that she swore by. Feeling rather smug, I purchased it and couldn’t wait to try it for myself. The packaging is their usual black tubs which you can buy in a smaller size or a larger one. As I wasn’t sure how it would work for me I opted for the smaller one that’s priced at just over £6. It’s great that the product can also be used on the body as well as the face. I also love that if you collect 5 of these black pots and take them back to a Lush store they give you a free face mask! Read about their recycling scheme here. When you open the tub of Angels on Bare Skin, you can immediately smell the raw ingredients used but it’s not overpowering or horrible to smell. The consistency of the cleanser is a crumbly clay-like substance. It was recommended that I take a small amount into the palm of my hand and add some water until it became more of a paste. The paste was then applied to my face and I worked it into my skin before washing it off. 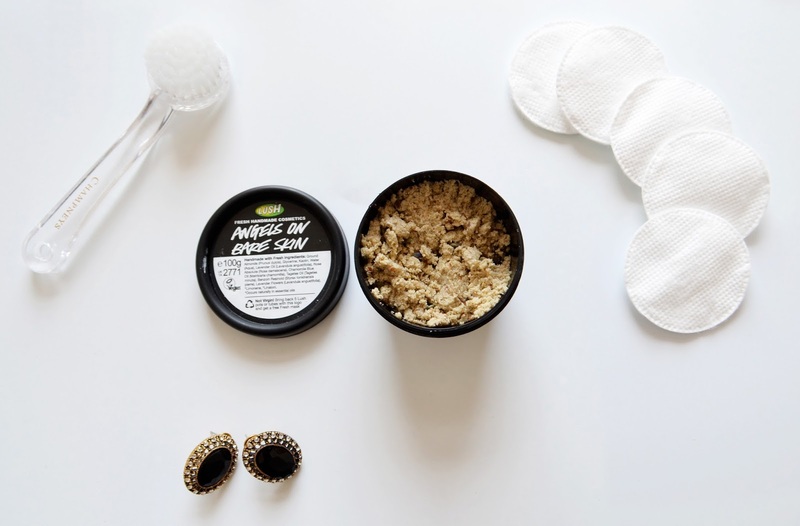 The ground almond pieces were brilliant in helping to gently exfoliate my skin without too much effort or hurting my sensitive skin. I had recently read an article on how exfoliators that use plastic beads are harmful to the environment as they don’t break down in the sewage system. Knowing that I was using an eco-friendly product made me feel even better about using it. 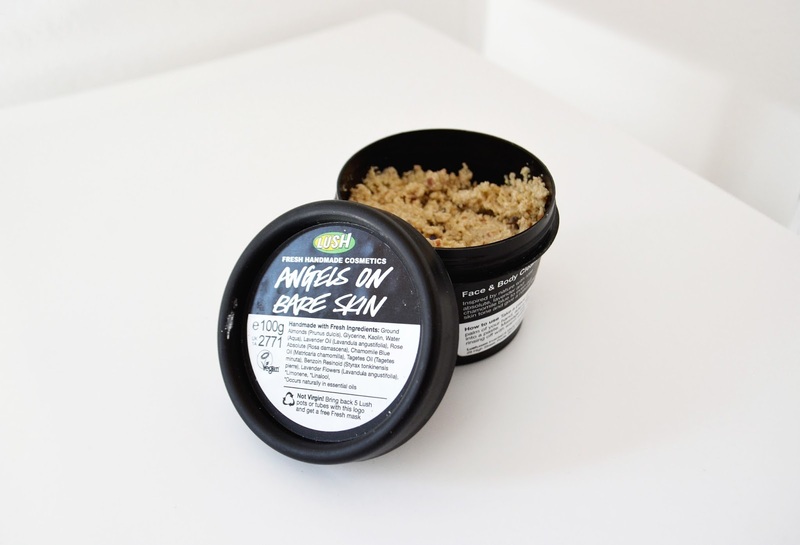 I always like to read what the brand claims about their products and Lush advertises that this product will “Even out skin tone, reduce redness and improve the health and appearance of your skin, giving a natural healthy glow”. Sounds ideal right? Well I can honestly say after over a fortnight of use my redness has decreased. I will be honest though and say that I am also using rosehip seed oil for redness so that could be helping too. I did also find that my skin appeared to be slightly brighter which is definitely a huge plus for me as I suffer from pigmentation problems. What I love most about Angels on Bare Skin is that it’s extremely hydrating and doesn’t leave my face feeling tight after use. This feeling of clean yet moisturised was apparent from the first which is rare in products. My only very small gripe with this product is that it gets quite messy. My bathroom has a very big sink so it catches all the bits that fall off my face however I can imagine if it was any smaller I’d have cleanser bits all over the place. I’ve got my sister hooked on this cleanser too and I’ve also heard that it does wonders for acne. If you haven’t already, I recommend you get yourself down to a Lush store and pick up a pot. Definitely worth it!